Ah, two of my favorite things! 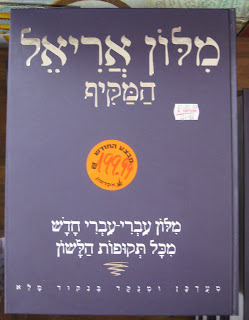 Speaking of words, I am thinking of buying a decent, one volume, Hebrew-Hebrew dictionary at Shavua HaSefer in Jerusalem this week. 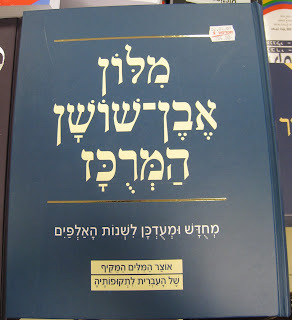 I think they're likely to be better than most Hebrew-English-Hebrew dictionaries, certainly than the small or medium-sized paperback ones I've seen (Oxford, Bantam-Megiddo, Zilberman, etc.). If nobody knows the difference between them, I will buy according to price and weight. 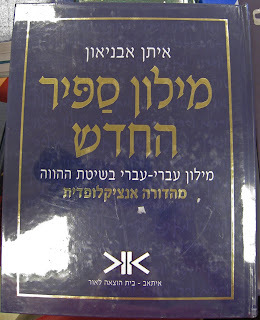 Also, if someone/everyone is quite sure that the multi-volume Even Shoshan or multi-volume Alkali is much better, I will consider buying one of those instead. They're just much larger and heavier than any of these. 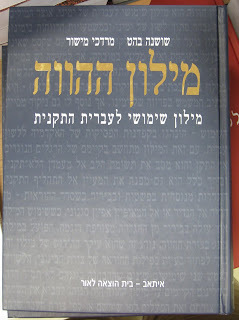 This was taken from here, the list of the Academy of the Hebrew Language's newly-approved Hebrew (non-cognate) words for transportation. Update: I broke down and bought the full six volume Even Shoshan at Shavua HaSefer last night. I have no idea how I'm going to get it back to the US, since it weighs a ton, but despite it's high cost, it seemed a better deal than the huge one-volume dictionaries pictured above.